Indoor climbing shoes: What should you look for? Rock climbing has changed a lot over the last 10 years. It used to be the case that your introduction to climbing came through mentorship, and exposure to the outdoors. With the explosion of climbing gyms – especially in Melbourne, with the imminent opening of Urban Climb’s first interstate venue, in Collingwood – it’s becoming increasingly more common for climbers to pull onto their first boulders indoors and do much of their training in gyms. For all you gym rats out there, we thought we’d put together a little guide as to what to look for in a climbing shoe if you’re going to spend most of your time pulling on plastic. The firmness of the climbing shoe relates to the amount of bend that the shoe allows for. Some shoes are highly rigid, while others allow for a substantial degree of flex. The benefit of firmness is that it allows for great edging ability – standing on small holds with a small amount of rubber in contact with the wall – but it sacrifices sensitivity, since you lose some ability to feel through your feet when standing on holds. In gyms – particularly, those that set with use of volumes and a focus on balance – erring on the side of sensitivity gives the best results, generally. While edging is important in gyms, plastic footholds are always going to be larger and easier to stand on than the footholds you would use outdoors, so hard-edging shoes are probably overkill. 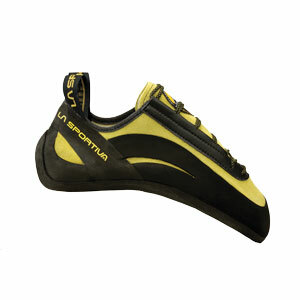 A lot of elite indoor competition climbers go for something soft and sensitive, like the La Sportiva Python (pictured), for instance. The profile of climbing shoes varies a great deal. Some shoes are essentially flat (neutral) and others have a substantial curve toward the toe (aggressive). The reason for the curvature in shoes is mainly to assist with climbing steep routes, when a curved shoe allows climbers to ‘hook’ with their toes more effectively, and put power through their feet. On less steep terrain – slabs especially – a neutral or only slightly curved shoe is likely to perform better and be more comfortable. So what’s the go indoors? Well, it simply depends on the gym where you climb and what angles you like to climb on. If you rarely climb really steep routes (past 45 degrees overhanging), a super aggressive shoe is probably excessive. For these purposes, any of our neutral shoes – like the La Sportiva Tarantula, La Sportiva Finale or Red Chili Sausalito – would be good choices. By the same token, if you spend no time at all on slabby or vertical terrain, and are all about power pulling in roofs, a neutral shoe will not help you get the best out of your climbing. In that case, look at our more aggressive shoes, like the La Sportiva Genius, La Sportiva Miura VS and La Sportiva Solution (pictured, and a firm favourite with the world's top climbers and boulderers, like Sasha Digiulian, Margo Hayes and Nalle Hukkataival). Maybe the biggest difference when you climb indoors compared to outdoor rock climbing, is the sheer quantity of climbs that you’re likely to get through in a single session. 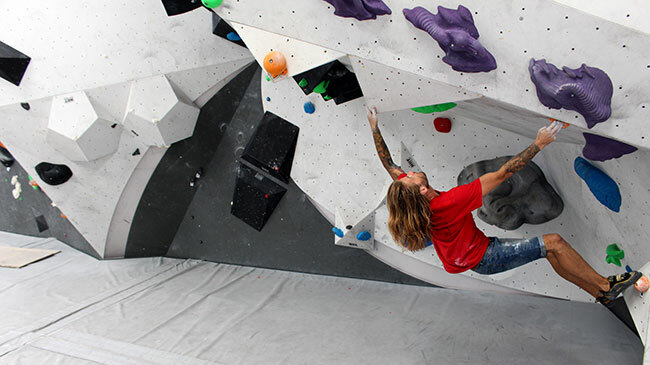 Compared with a day at the crag climbing – where you might get up 3–5 routes over a few hours (depending on how efficient you are, how hard the climbs are, and whether or not you're projecting, of course) – you’re likely to do a lot more routes and boulder problems in a single session in a gym. This means that, potentially, you're going to be wearing your shoes for a lot longer than you might outdoors. Comfort is going to be important. There’s simply no point getting that extra 10% in edging performance if it means you’re going to be in agony for the majority of the session. Go with something that’s comfortable. Ideally, a shoe that can be worn continuously for at least five minutes without causing serious discomfort. Bear in mind that comfortable doesn't necessarily mean not aggressive. Comfort is about how well a shoe fits your particular footshape. That's why we stock a wide range of shoes that are designed for different foot shapes. 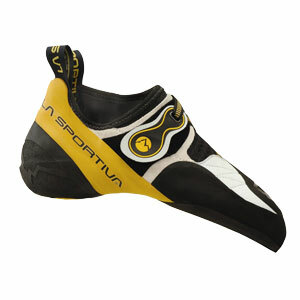 The La Sportiva Katana, for instance, is technically and performance-wise a very similar shoe to the La Sportiva Miura (pictured); however, some people find that the Miura fits them perfectly, while others can't wear them at all. When you’re climbing indoors, your shoes are going to be going on and off a lot. Probably much more regularly than when you head outdoors. If you’ve got a comfortably fitting lace-up (like the La Sportiva Mythos, for example), this won’t be much of an issue, because you can simply wear your shoes for the entire duration of your session. If you’re going for something a bit tighter, a Velcro or slip-on option can be easier to get on and off, while retaining good performance that a tight shoe will provide. 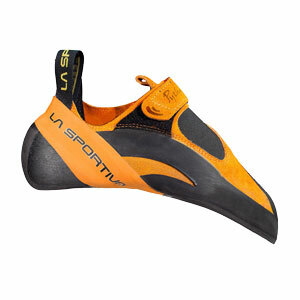 Examples: La Sportiva Python, La Sportiva Solution, La Sportiva Otaki (pictured). 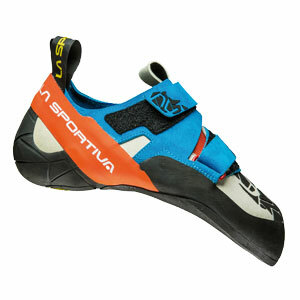 See our range of rock climbing shoes. Need help choosing a pair of rock climbing shoes? Visit us, email us or call us (03 9600 0599). WHICH ROCK CLIMBING HARNESS SHOULD I BUY?